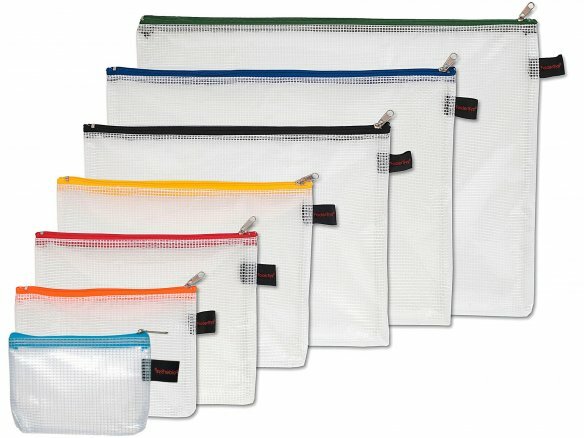 These transparent bags are wonderfully practical for packing away all kinds of things in an orderly and clear manner. They are especially useful when travelling in that shampoos and shower gels can be packed in them so as to allay any worry about leakage. In view of the new carry-on luggage regulations, the permitted amount of fluids in their 100 ml containers can also be placed in these bags for the same reason. The larger pouches can also be used to protect things like pictures, drawings, folders, school things and blueprints while they are being transported. Are you a commercial customer and do you want to put your logo on selected products? We offer monochrome printing for a minimum order of 300 pieces. Please allow for 4 to 6 weeks time from the first consultation to completion of your customization work. You can find further informations and the request form on our Modulor Services site. No results found. Please reset filter to get results. How do I choose my dimensions correctly? Select an article variant please. item no. Please select a article. Sorry, this article is currently sold out. Simply leave your email address and we will notify you when it is back in stock. Courier Service available (Berlin): If the Courier Service option is selected, this article will be delivered on the same workday (Mon-Fri) if ordered before 2 pm. Orders made after 2 pm will be delivered on the following workday. Express Delivery available (DEU):Select Express Delivery during checkout and receive this article as early as 1 to 2 workdays (Mon-Fri). The delivery dates and available delivery options can differ for orders containing various items. We will determine the final delivery date and provide that information during checkout before you confirm your order. Are you in the neighborhood? During the ordering process, you can choose if you want to pick up your order in our store. We understand that sometimes you simply need to return an item. That is why we offer you a 30 days return policy on all unused articles.